They come together quickly and are a snap to decorate. The best part is, they really do mimic ice cream scoops. :) I think they'd work out great for April Fool's Day too! Decorating requires nothing more than adding chocolate brown royal icing (free form), sprinkling some jimmies on while icing is still wet and topping with a red candy "cherry". I love the look! 1. 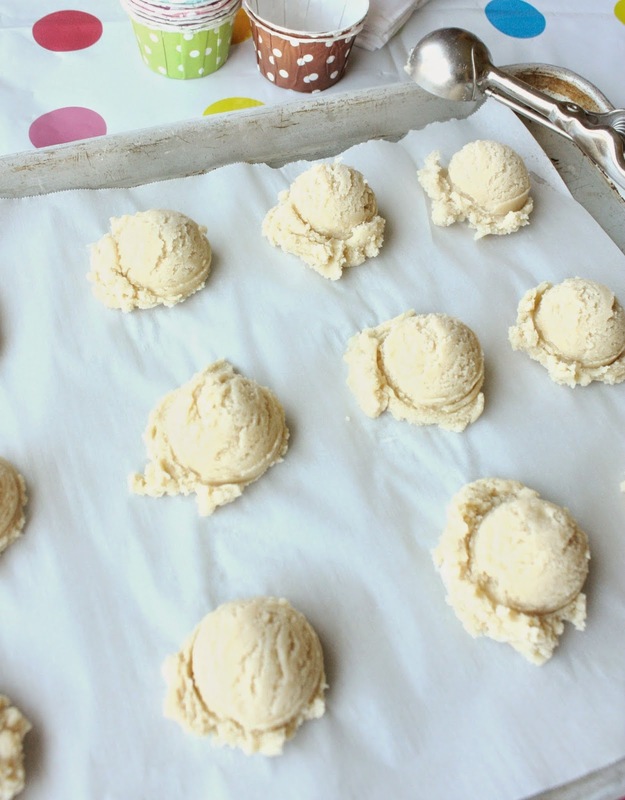 Make sugar cookie dough. 2. Pack the cookie scoop to overflowing so that when you release the dough onto the baking sheet it looks like a scoop of ice cream, with the excess rim (see second photo from top). 3. Once you have all the scoops you want, place the baking sheet in the freezer and let the cookie dough freeze completely, all the way through, which will help the dough stay in the scoop shape. 4. Bake the cookies for 12-15 minutes. 7. Sprinkle on the jimmies and add the candy "cherry" while icing is still wet. 8. Allow cookies to dry completely. How fun! Love to see your cute ideas! These are absolutely adorable, Sue! I love them! 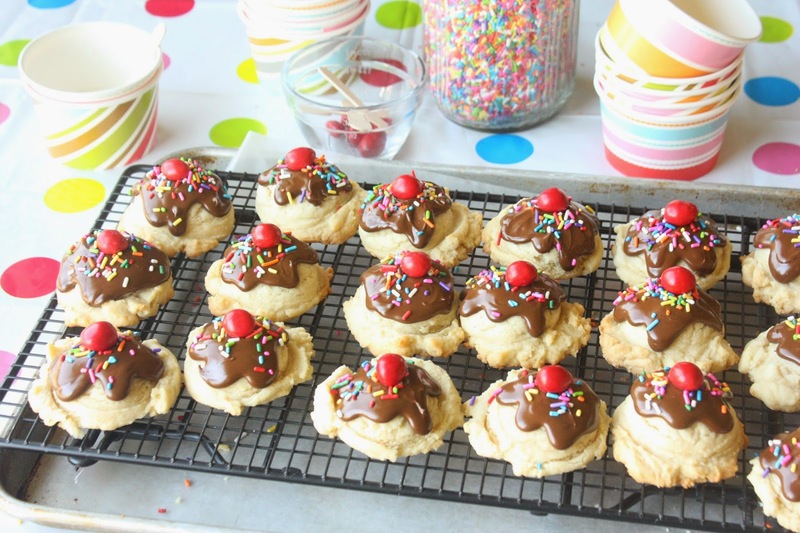 I am going to make these one day, they are too adorable and enticing not too. 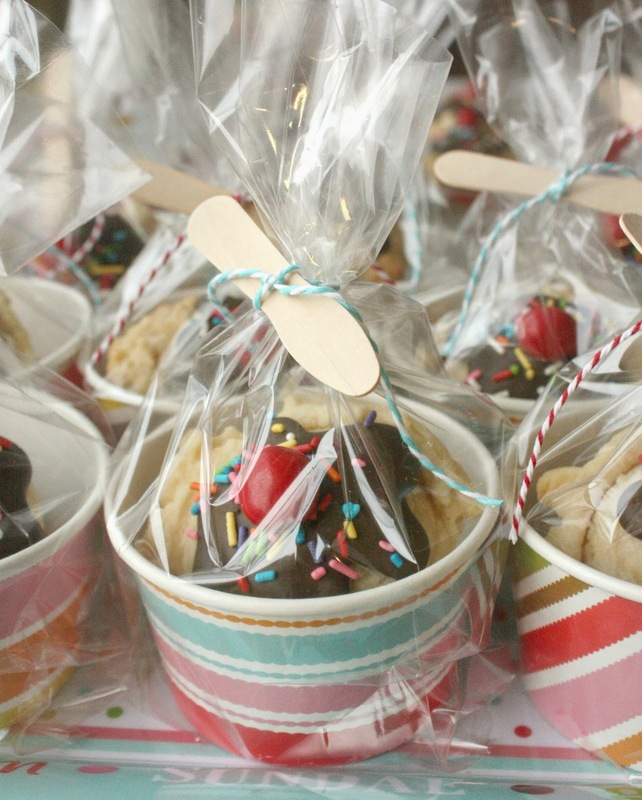 Love how you packaged them in the ice cream cups. So original and so effective. Glad you like them, Paula! They are very fun to make! this is so stinkin' adorable...just pinned!